Please accept my humble obeiscances. Srila Prabhupada jayatah. sending it to you just in case this point is not in your awareness. made notations in his own hand. He did the proofreading of the galleys. Now everybody knows that Prabhupada never intended his Gita to be abridged. referred to is the complete work. on PAMHO’s address list who I am at all familiar with. I, at first, feel guilty that I was not aware of the fact that Prabhupada’s Gita has been revised. I wish to thank Mahajana Prabhu for bringing it to my attention. I have a 1972 paperback edition which I read always. 1) Sanskrit words are mistranslated. 2) Some parts of the translation are wrong. 3) There is nothing new added to enhance in the understanding of the verse. It brings us the point that why this exercise was taken. If there were any typos , misspellings etc those may have been changed. But with so many changes and wrong changes at that what was accomplished? I am sorry to say that persons responsible for revisions are/were neither scholars of Sanskrit nor steeped in spiritual tradition. To meddle with the work of a departed soul is not even civilized. I will like to elaborate my point by comparing some verses of Gita. a. Gita 2.30 – The word nityam is not included in the translation. This is one of the important quality of soul. Nityam(eternal) appears many times in the purport, however. Why did the revisionist omitted it in translation? b. Gita 2.51 – the word manishinah is not correctly translated. Srila Prabhupada correctly used ‘wise’ in his translation. In word to word meaning part both new and original use ‘sages and devotees’ which is not the correct translation of the word. If a revision was needed it should have been in the word meaning section. One of the qualities of a devotee or a sage is that he is wise but that is not the meaning of manishinah. For example, milk is white but one can not translate milk as white. Like this there are numerous errors in the revised work. Prabhupada’s Indian English has a charm, they way the sentences were formulated is unique and personal. There was no need to change it or polish it. And then when it was done more mistakes were made. 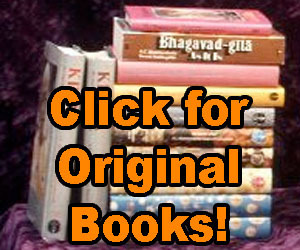 Prabhupada had an urgency to get his books published as soon as possible with the help available to him. The revisionists had all the time in world and still they managed to mess it up. They should consider to re-revise it and restore the soul of the original Gita. The authorities who approved it should realize that they have no right to fool with Prabhupada’s books. If they feel that they are very scholarly let them write their own books. All the devotees should bring this matter in front of GBC and demand public hearings on the matter. Please contact me with your comments. Hari Bol and all glories to Srila Prabhupada!!! Yes , the BBT book changers took out the word “eternal”, but it is there in the sanskrit, nityam, and it was approved by Srila Prabhupada for publishing. This word certainly enhances the text along with the idea that the soul is never killed. The living entity merely dwells in the body, and is apart from the temporary nature of the body. The word for word lists bhutani as meaning living entity, whereas the word “creature” is used originally. The revisors changed “living entity” to “living being”, omitting the word creature. Using the word creature enrich’s the text since “living entities” is already there in the word for word.